"Lots of thrash bands do their best to sound retro, but Hell Fire manage to sound classic." -- Kerrang! Kerrang Magazine previously launched title track "Mania" HERE. And, CvltNation shared "Warpath" HERE. Mania is the band's first proper album on RidingEasy Records, following the label's worldwide reissue of the band's self-released 2017 sophomore breakout Free Again, released on January 18th. 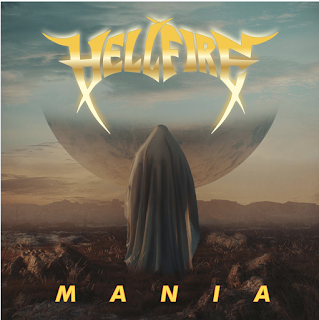 Formed in recent years in San Francisco, though it may seem more likely that they hatched fresh out of a time travel portal from the mid-80s Bay Area thrash scene, Hell Fire have the classic look and sound of modern metal's halcyon days. Hell Fire's sonic assault warmly condenses elements of influences like Angel Witch, Iron Maiden, Rainbow, Exodus, Metallica, Riot, Virtue and Diamond Head into 10 tracks of headbanging MUYA anthems. 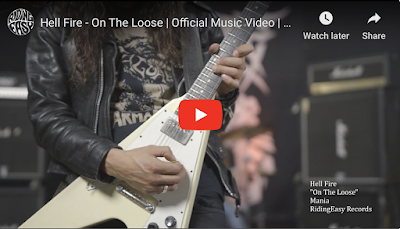 The free-wheelin' creativity and infectious vitality of the 80s Bay Area thrash scene is a moment forever locked in time, but its spirit lives on in the band's galloping guitar picks, soaring harmonies and blistering rhythms. Hell Fire's perfect hybrid of NWOBHM theatrics and American thrash attitude. "Thematically, everything on the album comes from personal experiences," says vocalist/guitarist Jake Nunn. "From the highs of partying together out here in Oakland, or the nostalgia of being a kid learning Zeppelin on a beat up guitar, to the extreme lows of isolation, personal trauma, and mental illness. Sonically we want our records to sound like you're standing in front of the stage at a show. The power of Marshall stacks in front of your face, drums at your ear level, thunder of the bass and feeling the presence of the room." Hell Fire achieves just that - and then some - on Mania. The album was recorded in Grass Valley, California at engineer Tim Green's Louder Studios. Having also recorded their previous album Free Again with Green, the sessions proved highly productive for the band since they were already familiar with the setting and able to expand upon ideas they hadn't been able to explore previously. "We're more excited about Mania then anything we've ever done," Nunn says. "We were able to spend a bit more time arranging the songs and writing from a more personal perspective lyrically. We came out of this recording feeling much more accomplished with our performances and couldn't be more happy for this to be our first release with RidingEasy Records." Hell Fire began when bass player Herman Bandala moved to San Francisco from Tijuana, Mexico with the hopes of forming a heavy metal band. Herman posted an ad to Craigslist which caught the attention of guitarist Tony Campos. They bonded over a mutual love of 80s thrash and NWOBHM, which was a hard thing to find in the Bay Area scene at the time. The lineup slowly morphed over time, finally solidifying with vocalist Jake Nunn also taking up second guitar duties and drummer Mike Smith joining prior to 2017's Free Again. Mania is available on LP, CD and download, released on March 29th, 2019 via RidingEasy Records. Pre-orders are available HERE.